Located between mountain ranges, Manchester is easier to get to from north or south than from east or west. 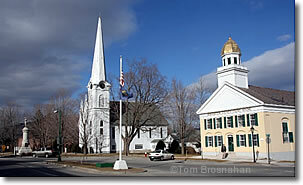 Manchester VT is served by s, the faster north-south highway in western Vermont; and several Vermont highways including VT 7A and VT 30. However, to reach Manchester from Interstate highways to the east (I-91) or west (I-89), you must cross the Green Mountains to the east or the Taconic range to the west, and this can take some time. Amtrak trains serve Rutland VT (32 miles/51 km north) and Albany-Rensselaer NY (62 miles/100 km, 1.5 hours; map). The nearest airports to Manchester are Rutland Southern Vermont Regional Airport (RUT), with daily service to Boston's Logan International Airport; and Albany (New York) International Airport.